We served this dish at our Chardonnay blind wine tasting last month. The recipe is an adaptation of the Poached Leek and Dorset Blue Vinny Cheese tart recipe by Hugh Fearnley-Whittingstall of River Cottage in the UK. For the blue cheese we used an Upper Bench King Cole cheese. The result was a more subtle taste than you might think and even those who don’t like blue cheese thought it was superb. 100g Upper Bench King Cole blue cheese – fab! 2. On a lightly floured surface, roll the pastry out quite thinly and use to line a 25cm loose-based tart tin, letting the excess pastry hang over the edges. Line the pastry case with greaseproof paper, fill with baking beans and place in an oven preheated to 340 ºF. Bake blind for 20 minutes, then take the tart out of the oven, remove the paper and beans, lightly prick the base all over with a fork and return to the oven for 5 minutes, until the base is dry but not too coloured. Carefully trim off the excess pastry with a small, sharp knife. Turn the oven temperature up to 360 ºF. 3. To make the filling, put the leeks into a saucepan with 100ml water, the butter and some salt and pepper. Bring to a low simmer, then cover and cook gently, stirring once or twice, for about 10 minutes, until just tender. Drain well, reserving the cooking liquor. 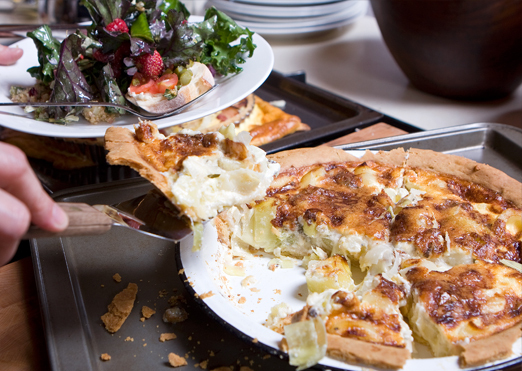 Spread the cooked leeks in the tart case and cover with the grated cheese. 4. Put the eggs and egg yolks, cream and leek liquor in a bowl and beat until smooth. Season to taste, then pour this custard over the cheese and leeks. Put the tart back into the oven and bake for about 30 minutes – the custard should be just set when you gently shake the tin. Serve warm or cold. Reprinted from Channel 4 News UK (with Upper Bench King Cole substitution for blue cheese). Check out the River Cottage Cooking School video. A favourite flour for bread and pastries and used for this recipe, is La Milanese Unbleached that is stocked by Nesters Market in Summerland. All ingredients except for the Upper King Cole Blue Cheese, were also from Nesters.